Washington State University freshman Stephany Lamas will spend the summer advocating for migrant farmworkers as part of a prestigious congressional internship. The software engineering student, whose summers typically are spent working the fields with her family, was selected for a HEP/CAMP National Association internship in Washington, D.C., where she will work closely with Ohio Congressman Anthony Gonzalez and his staff. The internship provides transportation to and from the nation’s capital, housing, a stipend, and even credit for clothing and the Metro. “I’m not only excited and honored to represent my family and WSU during the internship, but this will be an opportunity for me to share with lawmakers my experiences of being a woman of color with a migrant background, who is majoring in STEM and breaking the stereotypes,” Lamas said. Lamas is a participant in WSU’s College Assistance Migrant Program (CAMP). CAMP academic coordinator and retention specialist Rafael Pruneda encouraged her to apply for the internship. In using the word “unique,” Pruneda pointed out that Lamas attended five high schools before coming to WSU. If it wasn’t for Lamas’ mom planting the seed in her mind at an early age that going to college needed to be part of her life’s journey, it is very unlikely she would have ever enrolled here, or at any university. She was born into a military family and moved around a lot as a kid. Her dad was often deployed overseas and Lamas was forced to grow up fast so she could help her mom run the household, cook, and keep an eye on her younger brother and sister. One day while living in Reno, NV, Lamas’ mom arrived at her school by foot because her car had been stolen. She told Lamas that her father’s paycheck didn’t arrive in time to pay the rent and their landlord was kicking them out of their apartment. At age 14, Lamas and her family moved into a motel. Before long her dad’s contract with the Army ended and her family relocated to Lompoc, Calif., to harvest kale and broccoli. During the summers she worked alongside her parents, starting at three in the morning and often not finishing until eight at night, six days a week. As a sophomore in high school, Lamas and her family still lived in a motel, and for a stretch lived in someone’s garage. Her parents slept mostly on the floor so the three kids could share the two beds. Lamas was so ashamed of her living situation that she barely talked with anyone outside of her family. She ate her school lunches alone in the girls’ locker room or anywhere she could avoid her classmates. One way she escaped thinking about her living situation is by immersing herself in her school work. She really enjoyed learning and excelled academically. This boosted her self-confidence, and eventually she began opening up to others. Lamas’ family made a final move to Kennewick, Wash., to work the cherry harvest, and for the first time in two years, Lamas and her family had stable housing again. She blossomed into a charismatic and outgoing young woman who was ready to write a new chapter in her life. When it came time to graduate from high school, she applied for and received multiple scholarships, enough to cover her first two years of school at WSU. Lamas is also receiving valuable support from CAMP, a federally funded program designed to meet the needs of students with migrant and seasonal farm-working backgrounds. It provides them with academic advising, tutoring, skills workshops and a financial aid stipend. 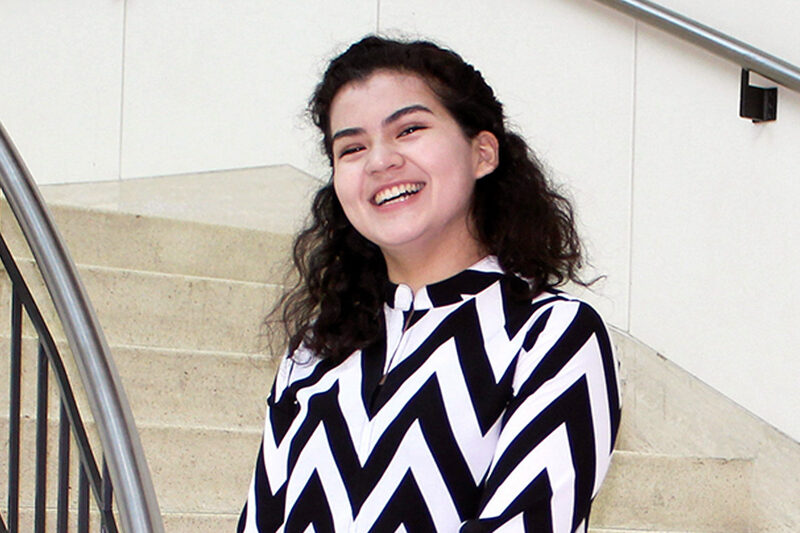 “CAMP has really help me with my transition to college and through it I’ve been able to meet a lot of other engineering students,” Lamas said. Looking back at her time growing up, Lamas says she wouldn’t change a thing. She acknowledges that although it was a very stressful time, her experiences made her assertive, driven, and direct—in ways that have helped her overcome her shame and shyness. Today she dreams of someday utilizing her computer science degree to create a medical software company that will help people with mental illness and other stresses in their lives. In the meantime, Lamas is excited for her internship and the opportunity to advocate for migrant families like hers. “My migrant background has humbled me when it comes to my capabilities and limits, however it has not ever made me question the possibility of developing and pushing them,” she said. The College Assistance Migrant Program (CAMP) is federally funded by the U.S. Department of Education through The Office of Migrant Education for five-year funding cycles. It has served students with migrant and/or seasonal farm working backgrounds since 2006 on the Pullman campus. Michael Heim is the CAMP Director. For inquiries regarding participant qualifications and services, contact the program at 509-335-4503 or wsucamp@wsu.edu.